Hmm, interesting, the same as the first page, except now they let me know that I probably didn’t violate their TOS (actually I’m sure I have doing something, not that they’re actually noticed). Additionally, there isn’t a form to fill out here, in fact there’s barely even a contact e-mail at the bottom of the page – but alas, I can’t use my e-mail account!!! 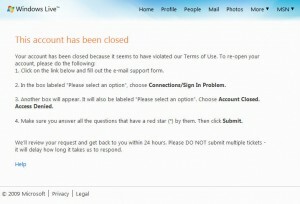 Somebody fails here, as they’ve suspended my e-mail account. So now what I would have to do is sign up for e-mail with somebody else! Great move, drive customers to OTHER service providers so they can send you an e-mail begging for their account back. I was eventually able to figure out that my account had been sending spam messages, so either the password was too weak and dictionary attack got it, I logged into this account through a bad access point and someone pulled it from the traffic, or I was on a computer with a keylogger/malware that pulled it. 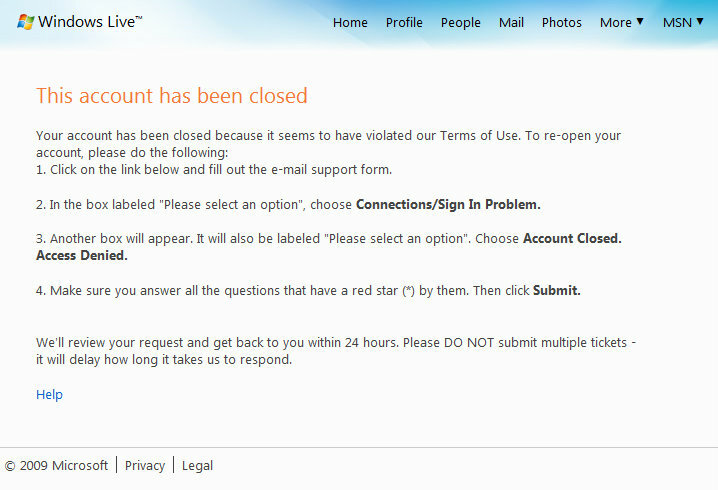 I rarely use the account except for MSN/Live Mesh, when I log into Hotmail I go directly to the page from a browser so I really doubt I got hit by someone phishing with a fake site. 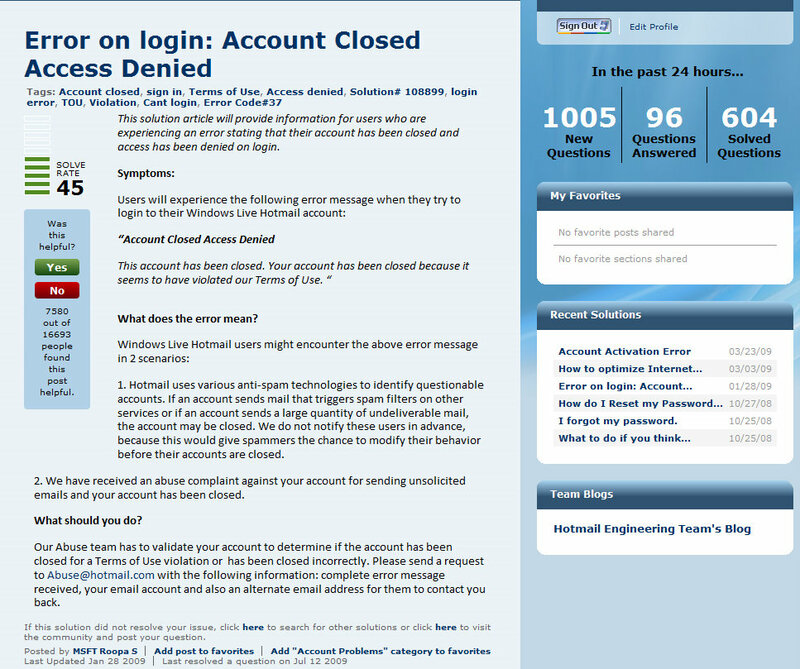 Moral of the story: use strong passwords and change them often, other moral is if you’re designing a web interface make sure you have a logical system set up for your users, in this case likely there are many programmers at M-soft and somebody never checked the links. This entry was posted in Webdevelopment and tagged Microsoft, Programming Fail on July 12, 2009 by Waterppk.